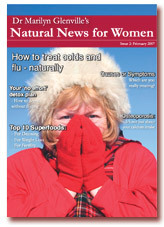 Why Natural News for Women? If you've ever been overwhelmed by all the contradictory health advice in the media and on the internet then this publication is probably for you. It was created as a response to the sheer volume of health information available these days. There's just too much to read if you're not a health professional, and half of it seems to contradict the rest. 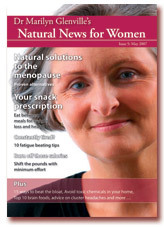 Natural News for Women provides a convenient and trusted source of health information. And it does more than that too. My approach has always been to blend nutrition with scientific testing, medical research and good common sense. Nutrition can do wonders for your health, wellbeing and energy levels. The aim is to have as healthy a life as possible, with the minimum of intervention - natural or otherwise. Nutrition is always the foundation of good health because your food not only gives you energy but provides the vitamins, minerals, essential fatty acids etc to manufacture your hormones, blood and bones and to make sure that your body is working efficiently. But as women our bodies' requirements change throughout our lives - much more so than men. We worry about our weight more, we have monthly cycles, a lot of us want to have children at some stage and all of us will go through the menopause sooner or later. Our bodies must adapt themselves differently at each stage and to do so effectively they need a different combination of nutrients. Shouldn't our body adjust itself naturally? Our bodies should adjust themselves and our appetites naturally, and indeed they would, if our lives were more in touch with nature’s rhythms. But unfortunately we are very out of touch - we eat bananas in winter, our homes are heated all year round, we don't wake at sunrise and sleep at sunset and so on. And even more importantly now our food doesn't even contain the same levels of nutrients that it used to. Because of intensive farming methods the nutrients have been leeched out of the soil that our food grows in. In fact there was one study recently that showed that there was a difference of 79% in the Vitamin C levels of oranges grown in different places. And compared to 50 years ago our food contains less than half of the levels of nutrients that it used to. Add to this our stressful lives - which reduce the absorption of the nutrients that we do eat - and you can see why such significant problems like osteoporosis, weight gain, infertility, hot flushes, etc. seem to be a normal part of our lives. But they aren't. They do not have to be and a lot of them can be corrected or prevented with a nutritional approach. You don't need to suffer through them, or the side effects of the drugs that are commonly used to treat them. I also cover the latest news, case studies from my clinic, questions and answers, recipes and much more but the main 5 headings above are areas of health that, as women, we will all have to deal with at some point in our lives. I don't believe that taking care of yourself and staying healthy should be a chore. That's why 'Natural News for Women' is designed to be easy to read, with no advertising. It also has some cartoons and lighter articles too so it's fun to read - not a chore and not research! That says it all really. The human body has the power for almost miraculous recoveries - in my clinic I often have patients who have unexplained infertility and who have been trying for a baby for several years. There is nothing the medical profession can do for them as there appears to be nothing wrong. But with the right nutrition, supplements and lifestyle changes many of them get pregnant – sometimes in as little as 3 months. You shouldn't have to constantly worry if what you're eating is right or wrong or if the supplements you're taking are in the right dosages, the right quality or the right form of the nutrients you need. That's not a healthy mindset and can itself lead to poor health. As a subscriber to 'Natural News for Women' you'll never have to worry about these things again. You'll know the right things to eat and the right supplements to take at each stage of your life - so you can get on with enjoying your life as a healthy and vital woman. That's how I believe we should all try to live and that's what Natural News for Women is for. It gives you a trusted source of natural health information, backed up by scientific research. And more than that, it will give you peace of mind. What do you get as a 'Natural News' subscriber? - You can write in for the Q&A section and ask any health questions you want. - Your Natural News issues are A5 sized so that it's easy to carry around with you. 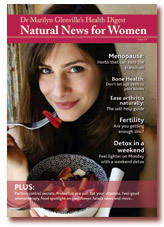 - 'Natural News for Women' is advert free, allowing you to read through the articles quickly and easily. As I don't want to sacrifice the quality or the content with annoying adverts, the price for Natural News is slightly higher than other publications as it is funded purely by subscriptions. - You can cancel your subscription at anytime within 30 days of your payment and you will be refunded the amount for all the issues you haven't yet received. 3 EXTRA BONUSES WORTH OVER £200 ! 1. The Health Detective - Your FREE online health analysis worth £100 p.a. One of the most popular services offered by The Natural Health Practice. It's an Online Health Assessment, a test that is an easy-to-use online questionnaire designed by me, Dr Marilyn Glenville PhD. When you complete the questionnaire you will receive your very own Health Detective Report and will discover what vitamin and mineral deficiencies you may have. If you are feeling tired or have a low libido, if you want to have more energy and feel better then The Health Detective will explain how you can rebalance your body, improve your well-being and keep yourself that way. A Comprehensive 7 - 14 page report (length varies depending on your requirements). A unique 3 Month Supplement Programme designed specifically for you, to rebalance the problems identified by The Health Detective . Dietary Recommendations designed specifically for you, to help alleviate the cause of your symptoms and to prevent them from ever returning again. By simply completing your online health questionnaire you will receive your very own plan of action, tailor-made and personal to you. This Test and Report is normally worth £100 per year but as a subscriber to the Gold Membership its included FREE and remember…you can use your Health Detective Test as many times as you like! Ever wondered how you can do your own research without using a tiresome internet search or a magazine article that does not give the full facts ? Your Exclusive Gold Membership also includes access to Health Notes, completely FREE with my compliments. Health Notes is a library of health and nutrition facts available online…not just to anyone but to doctors and health practitioners who demand the best information at their fingertips. Its such a valuable source of health and lifestyle advice that we feel it is essential to include this in your subscription, completely FREE. Advice on over 750 vitamins, herbs and minerals what they are used for and any contraindications. …and Health Notes provides the latest news on new products, up-to-the-minute scientific research and how to improve a medication’s effectiveness and ensure its safe to take. As an extra bonus, I am including a £10 shopping voucher that is redeemable against any of my books or any other items stocked at The Natural Health Practice. ‘Natural News for Women’ features carefully researched articles that are for your information and educational purposes only. I am always asked, however, where to purchase some of the supplements and tests that you may have read about. I have made arrangements with The Natural Health Practice, a very reputable healthcare mail order company, to stock most of the products I mention, so that you can order them directly online or, if you prefer to talk to somebody first, by mail order on the telephone. The Natural Health Practice also stocks all my books including the best sellers: “The New Natural Alternatives to HRT” ,“Healthy Eating for the Menopause” and “Fat Around the Middle”. 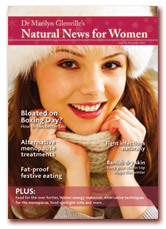 To receive your monthly edition of ‘Natural News for Women’ without any bonuses, there is a standard subscription package.